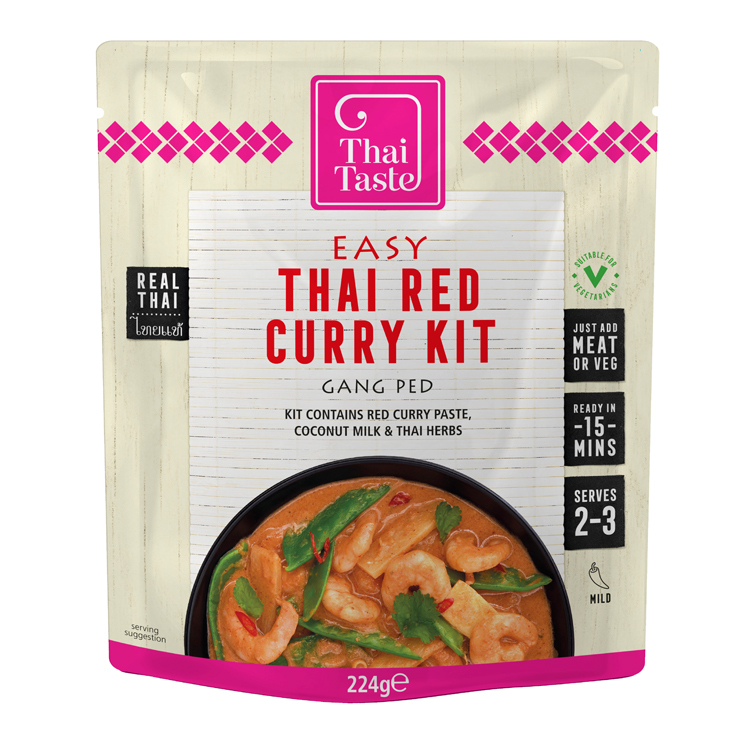 Thai Taste Red Curry comes in a packet. ‘No!’, I hear my trusting and loyal reader cry! ‘This pre-prepared dinner-helper can surely not be promoted by our favourite food writer?’ Well actually, yes. I am doing just what they do in Thailand – buying the curry paste from experts. Thai cuisine is popular all over the world and it’s easy to see why. It is a tempting and vibrant blend of spicy, salty, bitter, sour and sweet flavours which create a tapestry of taste. The company Thai Taste offers kits to make some classic dishes with all those delicious elements. These Thai Taste kits really are made in Thailand with fresh, all-natural ingredients, to make some of the most celebrated dishes that one might have tasted in good Thai restaurants at home, or even when enjoying a vacation in Thailand. The Thai Taste kits reflect all the characteristics of Thai dishes and use authentic ingredients, too. Thai Taste recipes can be made using products from their award-winning range and are designed to shorten the preparation time when creating authentic Thai food. Cooking is usually fast, and food is often prepared in a wok. The ingredients are cut into small bite-sized pieces. It’s just how they cook in Thailand, so that’s good enough for me. The Thai Taste company started almost two decades ago. Thai restaurants were opening all over the UK, giving more people the opportunity to taste this exceptional cuisine. Thai chefs in Thailand developed a full range of meal kits which could be prepared in minutes, simply by adding fresh meat, fish, tofu or vegetables, and were easily made in UK kitchens. These convenient Thai Taste meal kits help you prepare a delicious meal in just 15 minutes. To give something back, a percentage from every Thai Taste purchase is donated to the Duang Prateep Foundation, which helps support vulnerable communities in Thailand. This traditional and aromatic Thai Red Curry is said to be mild, but it still has good heat as one would expect. It works well with any type of meat, fish or vegetables, and even tofu. Coconut milk; red curry paste with garlic, lemongrass, red chilli, rice bran oil, salt, onion, galangal, coriander, kaffir lime peel, palm sugar, spices, an array of dried Thai herbs. There are also kaffir lime leaves, sliced lemongrass and sweet basil leaves. Just add your meat, fresh vegetables or seafood and dinner will soon be served!